DEATH. It’s the one experience everyone will share–except for Jak Hamelton. Three words whirl Jak to a garden paradise where a treacherous interaction ushers death and evil into the world. When a mysterious benefactor offers Jak the opportunity to bring the dead back to life and live forever, it sounds impossible But after Jak’s grandfather unexpectedly begins aging backwards, it appears the dream just might be reality. Jak and the Scarlet Thread is the first of a series of young adult/tween Biblical fantasy adventure books that will take readers through the entire Bible, starting with the tumultuous first nine chapters of Genesis. Nathan J. Anderson is a writer, speaker, radio host, teacher and musician intent on teaching families the Bible in ways that grab their souls and set them on fire to know God. He graduated from Bethel Seminary with a Master of Arts in Theological Studies, and spent ten years pastoring in Minnesota and Wisconsin. Diagnosed with non-Hodgkins lymphoma in July 2010, he spends plenty of time thinking about this life and the next, and trying to live with one foot in both places. Kate is a singer/songwriter pursuing a relationship with computer game designer Phillip. After her grandfather’s sudden death from injuries sustained in a suspicious car crash, Kate is forced to choose whether to focus on Phillip and her music career, or move back to Brands Crossing and honor the promise she made to her grandfather to investigate the mystery surrounding his death. 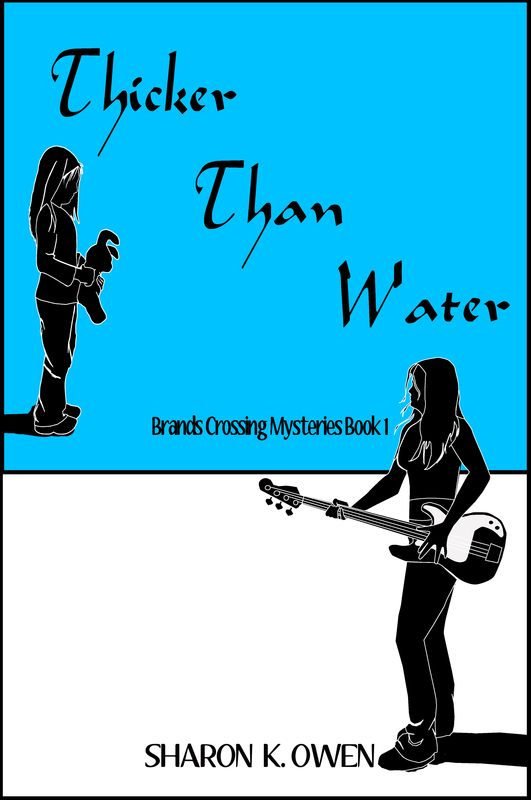 Thicker Than Water is the first in a series of novels set in Brands Crossing, Texas, centering on a mystery that extends back to the young Texas Republic. Sharon K Owen is working on the second book in the Brands Crossing Series. Her short stories and poetry appeared in Descant, Concho River Review, Iron Horse, American Literary Review, Trinity Writer’s Workshop newsletter and collections of Christmas stories. She teaches university classes in English literature, composition and communications, and on-line classes in creative writing. She lives in North Texas. This entry was posted in Novels, Reading and tagged Bible, Christian, fantasy, Jak and the Scarlet Thread, Nathan J. Anderson, romantic suspense, Sharon K Owen, SJ Driscoll, Thicker Than Water, tween, YA, young adult on November 16, 2011 by sallyjanedriscoll. What a kind thing to do. I hadn’t realized this was a regular Wednesday post. Funny, Karen, I never thought of this as being kind. To me, it’s practical. I love books and love publishing. This is just one way to show that. Thanks for sharing two books today. gives me another couple of titles to read. The idea behind the series that Jak and the Scarlett Thread starts is great. Kids aren’t likely to sit down and read the Bible, but they will read a story. Thanks! Doing this is such fun for me that I feel guilty about it. So glad you like it, too. Love the story blurbs. This is such a great way to discover new authors. Thanks for sharing these, SJ! Wow!!! Thanks so much for spotlighting my book. what a nice surprise when I opened one of my favorite blogs and saw my name and novel..
Oh yes, two more great authors for me to check out. Sally, I really like this two for Wednesday of yours. It exposes us to a lot of great writing that we might otherwise never find. Awesome idea, keep up the great work.